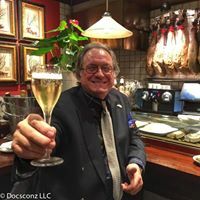 Gerry Dawes's Spain: An Insider's Guide to Spanish Food, Wine, Culture and Travel: Camino de Santiago Hikers Led by Restaurant Tycoon Andy Pforzheimer Spend a Day With Gerry Dawes in Spectacular Ribeira Sacra, May 2017. He arrived just after 2:00, and swept us into his car, headed for Ribeira Sacra - a lesser-known Spanish DOC whose great red wines are made from the Mencía grape. 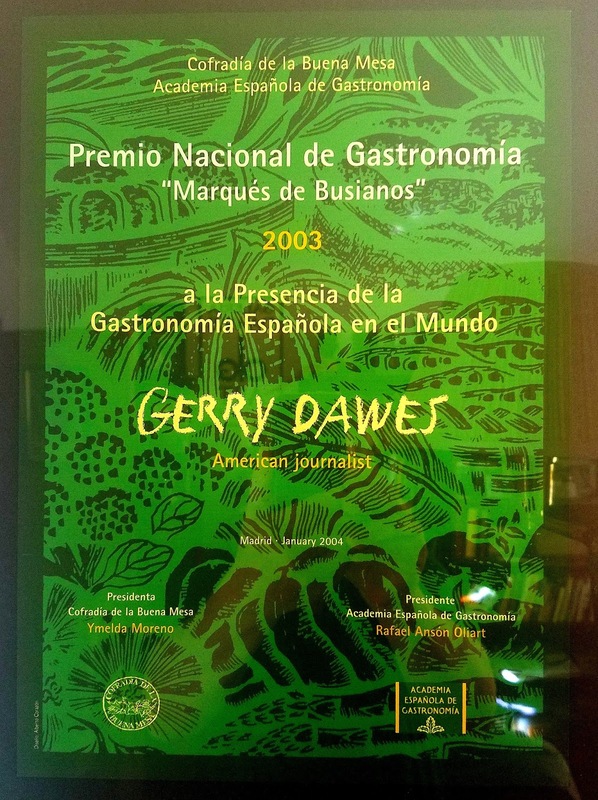 . . Gerry represents small growers, and imports their wines into the US, for a living, so these trips - hard miles in Spain on back roads to small farmhouses - are part of his daily life. He takes to the highway, then gets off in the middle of nowhere and winds his way onto a tiny road. "I would never rent me a car*," he observes. 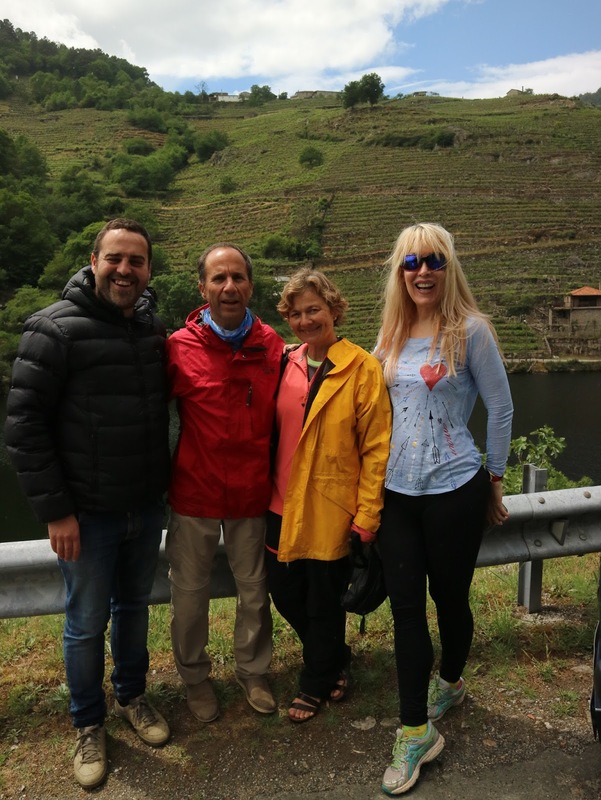 As we approach the Rio Miño, one of the growing regions of Ribeira Sacra, Gerry announces to the car that "You're about to see the most beautiful wine-growing region on the planet." This is how Gerry talks - most things are the greatest, or the worst, ever - and we are driving in flat scrub land under leaden skies, so I am completely unprepared when we come around a corner and there, laid out for me in 1,000 feet of plunging mountainside, is the most spectacular wine landscape I've ever seen. And while I am not a wine professional, I rub elbows with that world enough to have seen more than the average person's allotment of vineyards. ((Contemplate these sentences from the Camino de Santiago-addled Pforzheimer: "As we approach the Rio Miño, one of the growing regions of Ribeira Sacra, Gerry announces to the car that "You're about to see the most beautiful wine-growing region on the planet." 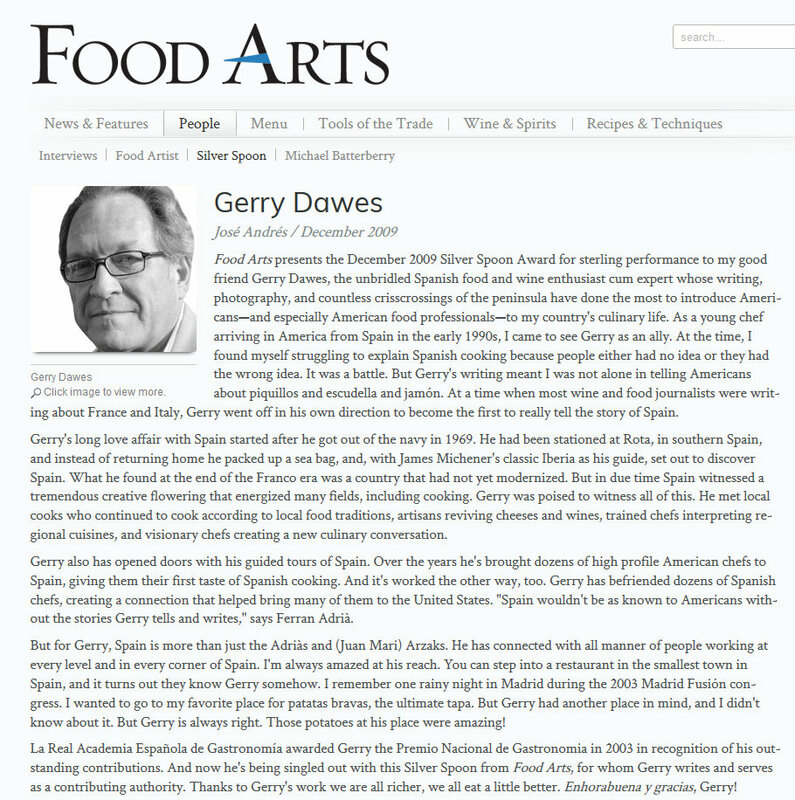 This is how Gerry talks - most things are the greatest, or the worst, ever - and we are driving in flat scrubland under leaden skies, so I am completely unprepared when we come around a corner and there, laid out for me in 1,000 feet of plunging mountainside, is the most spectacular wine landscape I've ever seen." It would appear, from Pforzheimer's account, and please correct if I am wrong, that I promised him "the most beautiful wine-growing region on the planet." and I delivered "the most spectacular wine landscape I've ever seen." I purposefully arranged the "flat scrubland under leaden skies" as a dramatic counterpoint. And Pforzheimer had not yet seen the dramatic canyon vineyards of the Sil River sections of la Ribeira Sacra yet. The terraces of Ribeira Sacra - both here and later on, in the canyons of the River Sil - plunge so steeply that they cannot be harvested by machine, so steeply that they cannot be harvested by horse or mule. Only humans, clambering down stone steps hundreds of years old with 40-pound panniers attached to their backs, can get to the grapes to plant them, tend them, prune them, and, finally harvest them. In some places the hillside is so steep that there are rails - the same as comprise railroad tracks - laid almost vertically down the side of the slope, with a carriage on wheels running on top, and the grapes are brought to the rail(s) where they are hoisted up the mountainside by rope* (*actually by mechanical winches and cables, driven by generators). There is a name for the winemaking (vineyard farming) that goes on in the Miño and Sil canyons, and it translates as "Heroic Viticulture." Gerry says that many of the terraces date back to Roman times, and slave labor, and it's hard to imagine how else they could have been built. We drive down the slope on a sinuous road that crosses the river at the town of Belesar. There, we meet Roberto Regal, one of the small winemakers that Gerry represents. He tends fields that are 100% organic, and makes a wide assortment of wines from the mencia grapes that serve as the backbone of his best reds, but also from the garnacha, and the brancellao, that were planted years ago as blending varietals. Gerry takes us to see a restaurant built into a barge on the bank of the river; it would have been our lunch spot but it is rented out, so we continue on to another restaurant, this one impossibly situated on a bend of the river at a point so wide that it overlooks a sandy beach. 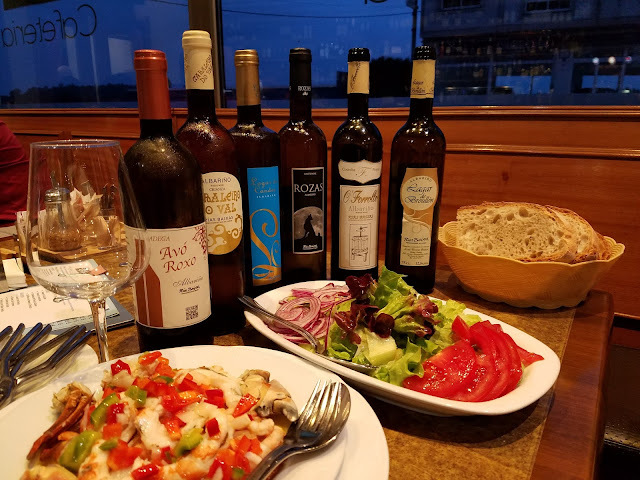 There, we taste our way through 10 or so wines while being treated to pan con tomate, wild mushrooms a la plancha, local cheese wedges, Serrano (Galician) ham, and Padron peppers. 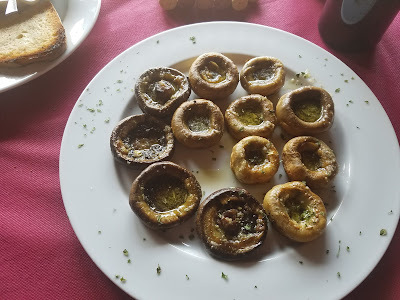 Hongos a la plancha, plancha-grilled mushrooms at Praia da Cova restaurante on the Miño River in Galicia's Ribeira Sacra. Photo by Gerry Dawes. Denise Reiss, VP of Reiss Entertainment, with a lineup of Roberto Regal's wines at Praia da Cova restaurante on the Miño River in Galicia's Ribeira Sacra. Photo by Gerry Dawes. We eat like starving people, and try all 10 wines, and are out the door as quickly as politeness allows. I know this drill well - there are many wines to taste, yet - but Denise is a bit shocked at how perfunctory we are with this wonderful food, these intriguing wines. Before she knows it we are back in the car and headed into the mountains, Gerry hardly worse for wear, and towards the canyons of the River Sil. The Sil canyons are, if it can be believed, even higher and more rugged than those of the Miño. 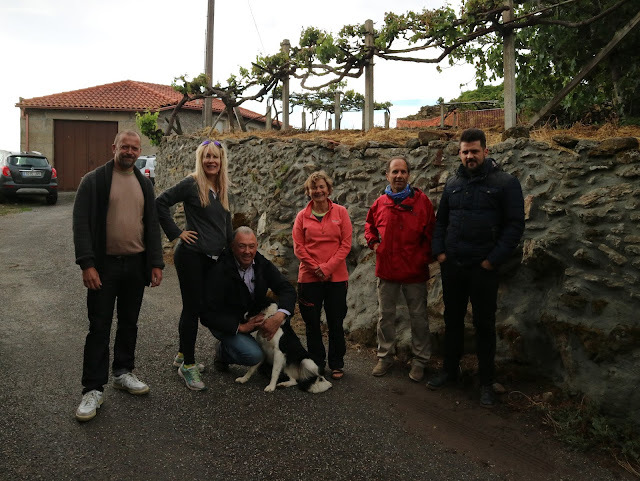 Here we are met by José Manuel Rodríguez, the head of the DOC for Ribeira Sacra, and the maker of an elegant, hard-to-find wine called "Décima." We are treated to a clamber in his spectacularly-sited vines, then we go to his house to try some bottles of Décima, and some tastes from the yet-unbottled 2016 in its stainless steel vats. 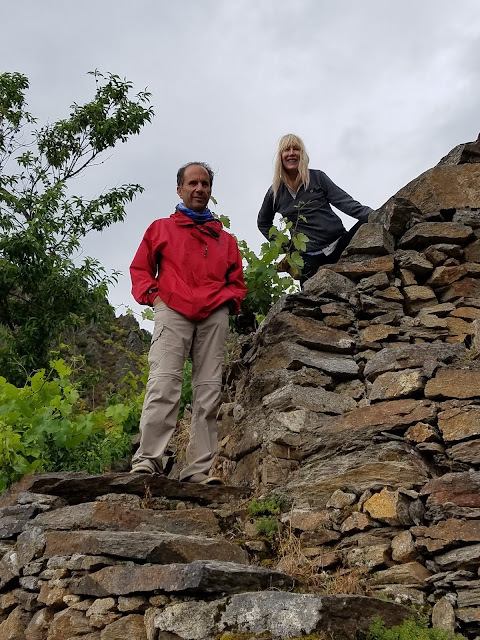 Andy Pforzheimer and Denise Reiss at the vineyards of José Manuel Rodríguez, Presidente of the D. O. Ribeira Sacra and producer of the stellar mencía-based red wine Décima. Photo by Gerry Dawes. 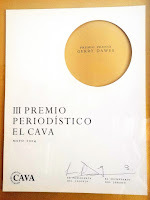 From Decima we headed to a third producer of Gerry's, Jorge Carnero, whose grapes are at the very bottom of the Sil Canyon, in one of the most flavorful parcels* of land (*Pforzheimer, the Hybolic, did not taste the parcel to see how flavorful it was! ), and one of the hardest to farm. We go to his house, which doubles as his bodega, his tasting room, his bottling plant, and the ancestral home of his great-grandparents back to the 1700s. 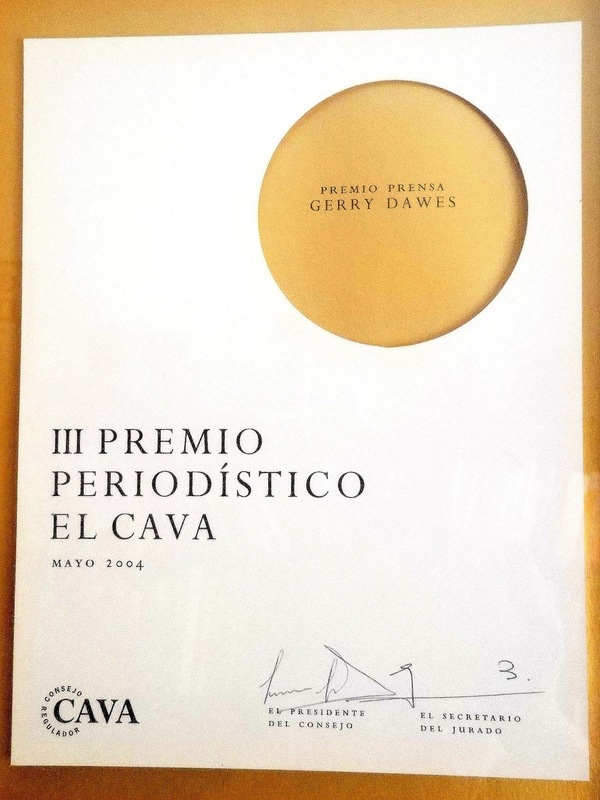 Jorge makes three wines under the Viña Cazoga label, a feat of unusual restraint: a white, made from Albariño, a red made from mencía, and a reserva, Don Diego, named in honor of his father. 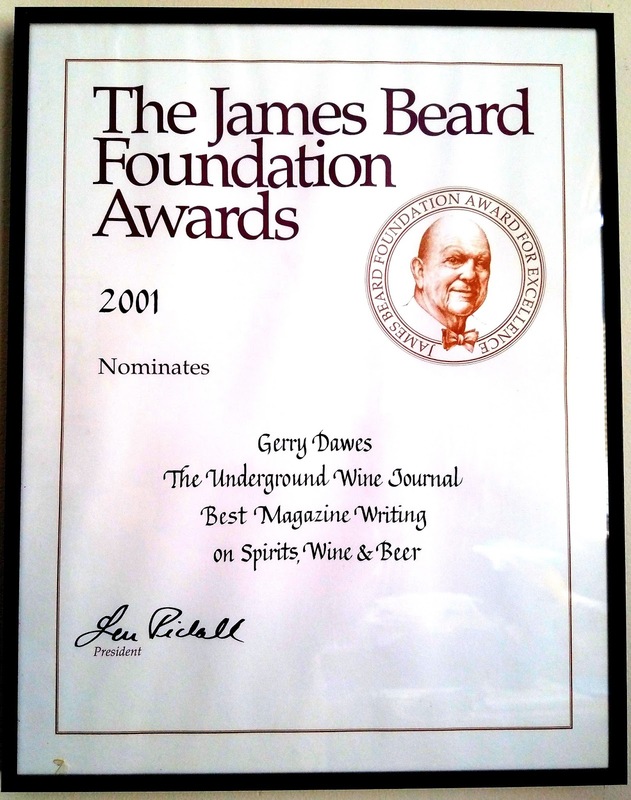 We drink it in the hall of the old stone house that he has been restoring for over twenty years. 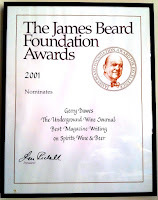 His partner shows us photos from far back in time - he with his shirt off, grapes weighting his shoulders as his picks his way through the vines far, far down, and smiling the smile of the young and foolish, ready to build a stone house with his hands, and make wine with grapes from the bottom of a canyon. Jorge Carnero, owner of Cazoga, Denise Reiss, José Manuel Rodríguez, Andy Pforzheimer and a friend of Jorge Carnero at Cazoga. Photo by Gerry Dawes. When we get back to Melide it is past 9:00, and Mike has been at the hotel for a few hours, waiting. Gerry has 6 bottles of Albariño waiting for him at the bar, cold. Zelie goes to bed. I make my way back downstairs where Gerry, Mike, Denise, and I eat octopus and drink Albariño until I tag out at 10:30. 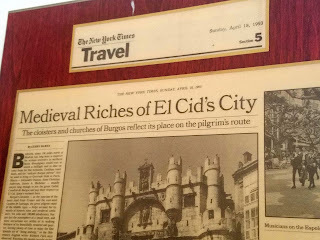 I love getting up early to face the Camino, and love wine tasting. . . but some things go together better than others. 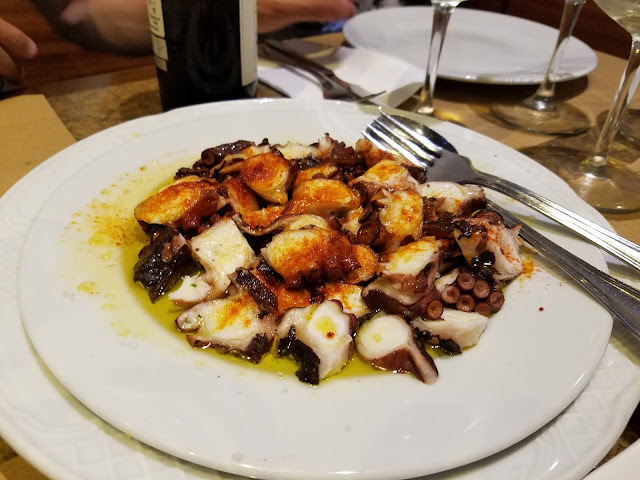 Pulpo a Feira (steamed Octopus with olive oil, pimentón [superb Spanish smoked paprika] and sea salt served with a lineup of Albariños--Avó Roxo 2015, Cabaleiro do Val Crianza 2010, Lagar de Candes 2015, Rozas 2015, O'Forrollo 2015 and Lagar de Broullón 2015--from The Spanish Artisan Wine & Spirits Group – Gerry Dawes Selections in the bar at Hotel Carlos 96 in Melide (A Corunna), Galicia on the Camino de Santiago, with Andy Pforzheimer and Mike and Denise Reiss. All photos by Gerry Dawes©2017.